Celebrate 2016 over carefully curated menus at some of the best restaurants in Los Angeles. Check out where to dine on New Year’s Eve from downtown to Manhattan Beach. The newest restaurant to hit the L.A. dining scene actually debuts on New Year’s Eve inside the Mondrian LA. Ivory brings market-driven dishes of California cuisine designed by chef Brian Malarkey to the iconic Sunset Strip locale. Dive in with a special five-course prix-fixe menu of selections that include winter squash soup; big eye tuna; honey-baked pork belly; Australian lamb rack; prime ribeye; and more. $100/pp. Celebrate over a special seven-course prix-fixe dinner to usher in 2016. Highlights of the menu include crab & uni, caviar, cauliflower; Maine Lobster, sunchoke, hijiki, miso; wild black sea bass, oyster plant, petit pois, pea tendrils; grilled A5 Wagyu beef, sweet potato, salted plum. $225/pp ($320 with wine pairing, $400 with premium wine pairing), early seating: 5:30/6/6:30 p.m.; late seating: 8:30/9:00/9:30 p.m. Enjoy a family-style feast with your choice of eight dishes from a menu of sixteen options. Highlights include prime aged beef with corned brisket, marrow and potato with the option to add freshly shaved black truffles; Pitman duck breast with sunchoke, pear, beet molasses and pistachio; and Pastry Chef Jun Tan’s Santa Barbara Bananas Foster with ginger pudding and white chocolate ganache. $125/pp. The top Santa Monica dining spot invites you to choose your own adventure, dining from the modern American a la carte dinner menu or opting for a five-course tasting menu featuring selections like sunchoke & chestnut soup, housemade pappardelle with pork sugo, grilled lamb chops, and chocolate souffle. Wine pairings from Owner/Wine Director Kevin O’Connor are available for $30 with a champagne supplement available for $16 a glass. Caviar and truffle supplements will also be on offer for those wishing to further indulge. 6-10 p.m.
Head to Manhattan beach to either dine on the restaurant’s stellar dinner menu complete with holiday specials like sea urchin toast, lobster pizza or a foie gras cheeseburger prepared with wagyu beef & truffle cheese. They’re also going to be running their Late Night Love menu from 10 p.m.-midnight at the bar/chef’s counter—get the “Downlow” burger or pizza + a glass of beer or wine for $20. Chef Bryant Ng celebrates New Year’s Eve with a Southeast Asian feast that includes dishes like a lobster chowder made with coconut milk; duck confit in lettuce cups and more. The Arts District favorite offers a 5-course, prix-fixe menu of French classics. Highlights include a selection of items for you to create your own menu with, including an amuse bouche of uni and caviar, lobster bisque, grass-fed tournedos of beef, diver scallops, as well as a variety of vegetarian options and a trio of desserts. Winter black truffles will be available as a supplement. Wine pairings from the Church & State’s all French wine list will also be available. At midnight, guests can celebrate with a complimentary champagne toast and party favors. $95/pp. Dine on a special five-course menu at the revered Santa Monica restaurant. Highlights include Maine lobster salad with Tuscan spelt and orange-infused oil; pasta course of handmade cannelloni di granchio with crustacean sauce and fresh Water Shrimp main course there is a choice of Fresh Wild Salmon with Lemon Caper Sauce or Costata di Vitello Pugliese – a prime veal chop with Mosto Cotto reduction. Also enjoy a fine selection of artisanal cheeses, ending with the restaurant’s signature Sicilian cannoli with pistachio. The restaurant also offers their a la carte menu. $140/pp, $60 wine pairings. Through Jan. 3. Chef Eric Greenspan channels the restaurant’s coastal European roots by continuing his Feast of the Seven Fishes menu. Order your favorite fish dishes a la carte, or indulge in the whole feast for $50. Highlights include crudo of scallop with grapefruit and chili; risotto of crab and uni with squash and orange; sole with olive tapenade and braised lettuce; whole snapper blood orange caper puttanesca; and assorted zeppole for dessert. And to kick things up for New Year’s Eve, there will be a champagne toast every hour on the hour. We can’t argue with that! Dine on a special four-course prix-fixe menu complete with jazz and party favors. Highlights include meatballs al forgo; rigatoni alla vodka; squid ink agnolotti with lobster, shrimp, scallop and sea urchin burro fuss; beef short ribs braised in barolo and more. First seating, 6-8 p.m., $99/pp; second seating, 9-10:30 p.m., $125/pp. Celebrate the new year surrounded by 2000 bottles of wine in the heart of Beverly Hills. Wally’s offers a special four-course menu for the holiday that features selections like roasted chestnut veloute; olive oil-poached lobster; and green lentils “du Puy” ragouté. First seating from 6-7:30 p.m, second from 9-10:30 p.m. $100/pp. Cozy up in the West 3rd St. jewel box restaurant over a three-course prix-fixe menu that includes local burrata crostino with roasted heirloom carrots and salsa verde; bucatini carbonara; branzino with caramelized leeks, asparagus, crushed potato, black truffle vinaigrette and zabaglione. Go all out this New Year’s Eve with a four- or six-course prix-fixe menu from executive chef/owner Josiah Citrin. Highlights of the menu include egg caviar with poached egg, lemon crème fraiche, and Osetra caviar (second seating only); Maine lobster with young turnips, endive and saffron curry; seared foie gras with Marche cherries (second seating only; almond-crusted Dover sole with squid ink orecchiette, and more. $150/pp for four-course first seating from 5:30-6:30; $295/pp for six-course second seating from 8:30-9:30 p.m. The five-course New Year’s Eve dinner includes kingfish sashimi; Wagyu tartare; charred octopus salad; scallop and mussel curry; short rib; and more. $75/pp. Ring in 2016 in style with a four-course prix-fixe feast ($150/pp) and a stylish cocktail reception ($100/pp). Both events will include market-driven menus inspired by Owner/Founder, Laurent Halasz’s passion for provincial fare unique to the coastal Riviera. Executive chef CJ Jacobson pulls out all the stops for an indulgent three-course forest-to-table menu. Highlights include buratta with persimmons; celery root foie gras veloute; Wagyu strip loin roasted with wild juniper branches; local white see bass pan roasted with juniper butter; chocolate truffle tort a la mod, served with bitter almond ice cream, malted caramel and wild rice soil. 6-10 p.m. $100/pp. Dine in the heart of West Hollywood over a four-course prix-fixe menu. Highlights include seared scallops with smashed cauliflower, gala apples, and pink peppercorn-cider gastrique; lobster and white asparagus panzanella; butternut squab and black truffle raviolo; bone marrow-crusted petit filet Mignon. First seating: $95/pp, 5:30 p.m./6:30 p.m., dinner only; late seating $185/pp, 9:30 p.m./10 p.m., includes entertainment as well as a champagne toast at midnight. The downtown dining destination hosts a masquerade themed prix-fixe three-course menu. Highlights include hamachi sashimi; Maine lobster pot pie; duo of prime beef filet Mignon and braised short rib and more. 6 p.m., $75/pp; $9 p.m., $125/pp, includes Champagne toast and party favors. Downtown’s swanky French dining destination celebrates 2016 with a dinner and dance party. Dine on a social three-course prix-fixe menu complete with Champagne. Highlights of the first seating include oysters; half lobster with bisque and baby vegetables; filet Mignon with stuffed truffle macaroni; and more. Ring in 2016 with a black tie New Year’s Eve party. $125/pp, includes reserved bar seating, two drink tickets, caviar, champagne, hors d’oeuvres, tax and gratuity; $165/pp includes reserved table seating, a punch bowl, two drink tickets, champagne, caviar, hors d’oeuvres, lobster, tax and gratuity. 9:30 p.m.-2 a.m. Celebrate the new year over a four-course family-style menu complete with music from a jazz trip. First seating is $85/pp, second seating $125/pp. Celebrate over a special luau menu with a whole suckling pig, tiki cocktails, live ukulele and a champagne toast. The Brentwood steakhouse throws a Roaring ‘20s bash. Celebrate over a five-course menu, roaming martini and caviar carts, burlesque dancers, bands, DJs and more. The Beverly Hilton is the perfect place to ring in 2016 over a six-course dinner that offers dishes like poached Holland Dover sole, grilled venison medallions and a dessert trio. Head to Hermosa Beach to dine on a four-course dinner that includes grilled romaine with avocado, Cotija, olives, corn salsa, egg, harissa buttermilk crema; Chocolate duck quesadillas; Plancha pork belly; and churros. $55/pp. the 100% organic, plant-based West Hollywood Mexican hotspot will offer a four-course mushroom tasting menu from executive chef Chandra Gilbert. The prix-fixe menu will also include a mushroom cocktail pairing from beverage director Jason Eisner. $65/pp. Choose from a three- or five-course menu with optional wine pairings at the restaurant’s new Hollywood location. Highlights from the three-course menu include Tahitian squash soup; a selection of potato dumplings with wild mushroom; local halibut with celery and fennel broth; beef tenderloin with turnips and bordelaise sauce. Dishes from the five-course menu include grilled oysters; lamb carpaccio with olive and feta; cedar-plank salmo; duck leg with oatmeal griddle cakes and seasonal fruit compote. All guests will receive a complimentary champagne cocktail upon arrival. Three-course menu, $65/pp; five-course menu $120/pp. One of Hollywood’s most exciting new restaurants offers two seatings of dining decadence. Highlights of the menus include oyster tagliatele with caviar; lobster capelini with shaved winter truffles; and wild mushroom risotto with shaved winter truffles. First seating, from 6-7:30 p.m., $60/pp; second seating, from 8 p.m., $75/pp. 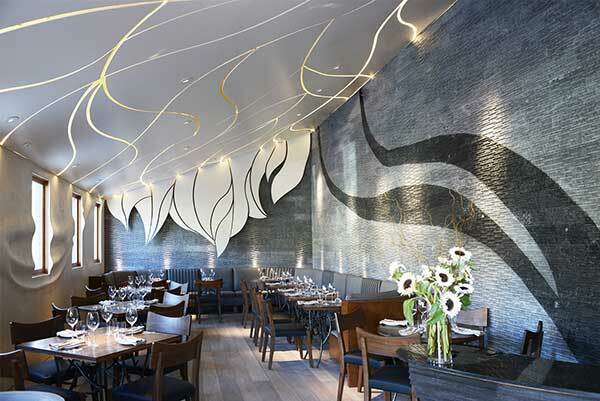 Ring in the new year in style at chef Brian Malarkey’s new glamorous, seafood-centric hotspot in Santa Monica. The Top Chef alum has crafted a special five-course prix fixe menu that pays homage to his signature “Fish Meats Field” philosophy, including line-caught ahi tuna and a dry aged rib-eye. An optional wine pairing is available. $125/pp, $75 wine pairing. Kick off 2016 over a five-course menu of decadent Italian cuisine. Highlights of the menu include big eye tuna crude; warm lobster salad; bigoli with white veal ragu, porcini and rosemary; cacio e pepe tortelli; roasted beef tenderloin; and more. You can also pair that with wine for $40. Chef Ann Conness’ Nuevo Rancho hotspot offers a three-course prix-fixe menu capped off with after-dinner Salsa dancing. Highlights of the menu include line-caught ahi tuna; steamed black cod wrapped in a banana leaf; Spanish sherry-braised lamb shank; beef short rib barbacoa and more. $75/pp for seating between 5:30-7:30 p.m.; $120/pp for seating after 8 p.m.; includes after-dinner salsa dancing. Make the Montage Beverly Hills your destination to ring in 2016. Scarpetta celebrated the night with the option of two seatings. The first one kicks off at 6 p.m. with a three-course menu of dishes like steak tartare; creamy polenta; and crispy striped bass; $88/pp. As the night progresses, you can dine starting at 8:30 p.m. on a five-course menu, along with live, music and party favors for $175/pp. Celebrate over top Mediterranean fare in the heart of Hollywood. The restaurant offers a four-course prix-fixe menu that includes highlights like lentil and quinoa falafel, grilled lamb chops and vegetable tagine. The Little Door family of restaurants hosts an Alice in Wonderland-inspired “Jardin Enchanté” New Year’s Eve party. The Little Door will offer a themed DJ, Queen of Hearts dancers, a fortune teller and a four-course pre-fixe menu with a first seating between 6-7 p.m. ($125/pp), and a second seating, which includes a champagne toast, after 7:15 p.m. ($150/pp). Little Next Door is offering prix fixe menu all evening ($75/pp) to ring in the New Year. All locations encourage partygoers dress “Fantastically” for the New Year festivities. Celebrate over a six-course or seven-course prix-fixe dinner that channels chef Michael Hung’s riff on modern continental cuisine. Highlights include porc au torch on with celery root a la grecque with pickled mustard and caper sauce vert and filet Mignon roasted in marrow fat with young carrots, potatoes persillade and auce Au Poivre. First seating from 5-9 p.m., six courses; 9 p.m. on seven courses with champagne toast at midnight. The West Hollywood restaurant celebrates A Night at the Mocambo in homage to the Sunset Strip nightclub and restaurant where Frank Sinatra made his Los Angeles solo debut in 1943. Mocambo Hors d’Oeuvres – shrimp cocktail, crudités, cheese puffs and jumbo olives. Next is a course of braised leeks and potatoes “vichyssoise” with American caviar, crème fraîche and chives, followed by hand-cut noodles “lobster thermidor” with Swiss chard and toasted breadcrumbs. The main course is Suzanne Goin’s updated classic of grilled beef tenderloin “stroganoff” with chanterelles, potato purée, sour cream and red wine. $110/pp for the first seating; $150/pp for the second seating, which includes live entertainment and a midnight champagne toast. Celebrate over a menu of highlights like crab and caviar toasts; snapper ceviche; ricotta gnocchi with lobster; grilled lamb chops and more. $135/pp; late seating includes a champagne toast. Celebrate Mardi Gras, a tribute to Louisiana dishes inspired by chef de cuisine Amy Deaderick’s Southern heritage. The four-course menu includes fried oysters with spicy remoulade; potato gnocchi with crab, black trumpet mushrooms, Parmesan and bread crumbs; a choice of shrimp etouffée with andouille sausage, white rice and mustard greens or bacon-and-apple-stuffed pork chop with jalapeño cheese grits and Swiss chard. Finish with toffee bread pudding with spiced pecans and banana rum sorbet. $95/pp, first seating, 5:30-7 p.m.; $125/pp, second seating, from 8 p.m., which includes party favors, live jazz music and a midnight toast. Dine on a three-course menu that include highlights like seared hamachi with avocado, beets and winter citrus; blue crab gratin with leeks, frisee and toast; grilled black bass with oxtail ravioli and black truffles; braised short rib of beef with lobster hash; and more $85/pp. Celebrate over a three-course menu with selections that include peekytoe crab salad with almond puree, winter citrus, black sesame and curry oil; roasted persimmon and pomegranate salad; black bass with ricotta gnocchi; ribeye of beef with buttered lobster and more. $85/pp. Dine on a menu that features decadent selections like Clevedon Bay oysters to off menu items such as oxtail risotto and dessert menu, $180/pp. The stylish newly remodeled steakhouse celebrates New Year’s Eve with a three-course menu that includes highlights like lobster bisque; butter-poached lobster tail and filet Mignon; and champagne vanilla mousseline. A la carte dining is also available. 5-10 p.m. $85/pp. Celebrate over luxurious offerings like caviar with capellini, celtuce and citron vinaigrette; langoustine ravioli with savoy cabbage and foie gras; quail with foie gras, kataffi and pomme purée; and barre caramel with sable breton and squash ice cream. 4:30-5 p.m. ($72/$100/pp three or four courses), 7:30-8 p.m. ($180/pp eight courses), 10-10:30 p.m. (a la carte). Dine in the shadow of LACMA on a Mediterranean-inspired menu. Highlights include lemon risotto with stravecchio and Parmigiano-Reggiano; squab breast with violet potato and black trumpet mushrooms; poached Main lobster with kuri squash veloute and finger limes; and dark chocolate tart with passion fruit sorbet and salted caramel sauce. $59/pp for three courses and $72/pp for four courses. Menu highlights include: Peruvian Sea Scallops with ginger lime vinaigrette; Seafood Linguini with housemade linguini, manila clams, shrimp, calamari, bay scallops, olive oil, white wine, garlic, and shallots; Roasted Rack of Lamb with root vegetable barigoule, and potato gnocchi; and Manjari Chocolate Brownies with chestnut mousse, satsuma orange segment, and bourbon caramel. $61 for three courses, and $75 for four courses; includes one complimentary glass of sparkling wine. 5-11 p.m.
California French cuisine in this garden café. Hamachi Crudo with kumquat relish, citrus crème fraîche, and American sturgeon caviar; Parsnip Agnolotti with black trumpet mushrooms, salsify, and ginger broth; Alaskan Halibut with sunchokes, honey & bacon glazed chestnuts, and wilted black kale; and Champagne Vanilla Mousseline with French meringue, macerated apples, and Champagne gastrique. $73/pp for three courses, and $96/pp for four courses; includes one complimentary glass of Champagne. 4:30-10 p.m.
Dine on specials like Lobster with baby frisee salad; cavatelli pasta with wild boar ragu; turbot filet with lemon and capers; and wood oven-grilled veal chop with wild mushrooms. You can also head next door to Bar Toscana for a stuzzichini menu and their classic menu paired with tunes from DJ Fabry Saxa. The West Hollywood English pub rings in the new year with a feast and music by DJ D Rad from The Tyde. Dine on specials like Cornish Starry Gazey Pie, Naked Cowboy oyster pan roast with American caviar and pan-roasted veal chop. Celebrate in Chaya’s stylish downtown outpost. The restaurant offers a four-course menu in the dining room and on the patio that features lobster, uni, foie gras and filet Mignon ($90/pp). A limited a la carte menu is also available. Open seating all night is available in the bar and lounge with $35/pp bar platters. Everyone can enjoy live music and a midnight Champagne toast. Ring in 2016 at the black tie affair that features a special omakase menu at the sushi bar along with a martini tasting bar menu. The restaurant offers two seating times for dinner. For the first seating from 5-7:30 p.m., you can dine on a three course menu for $85, with limited a la carte options available. The second seating, from 8 p.m.-close, features a chef’s grand tasting menu complete with party favors and a Champagne toast for $150/pp. Toast your new year in the Tony restaurant at the London West Hollywood. Highlights of the New Year’s Eve menu include burrata cheese with Castelvetrano olives and white truffle cream; lobster tortellini with brown butter; Wagyu filet Mignon and more. Seatings from 5-7:30 p.m. and 8:30-10 p.m., first seating is a la carte while second seating is a five-course meal with Champagne toast for $135/pp.